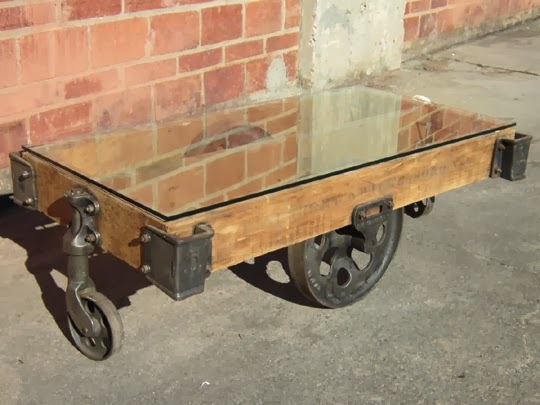 This gorgeous glass top sits atop a Lineberry cart, with 'industrial' style large wheels with cast lettering. Hardware has been polished, but this table has not been sealed or finished. We do not ship glass, but can sell the carts with or without the glass top. If you do not live close enough to pick up, you should be able to obtain a 3/8 in piece of tempered glass from your local glass supplier for about $150. Glass top dimensions: 28 x 48, table is 16 inches tall. Price with glass top - $700. Price without glass is $550. See more photos and details at http://nelsonstoragellc.com/G1212.html or place an order at http://www.shop.oldcoldstorage.com/Refurbished-Carts_c3.htm? As always, you can contact us at 434-263-4369.